Contestants compete in the final round on Ask Me Another at the Bell House in Brooklyn, New York. Heard on Awkwafina And Sasha Velour: New York City Queens. It's time to crown our big winner. 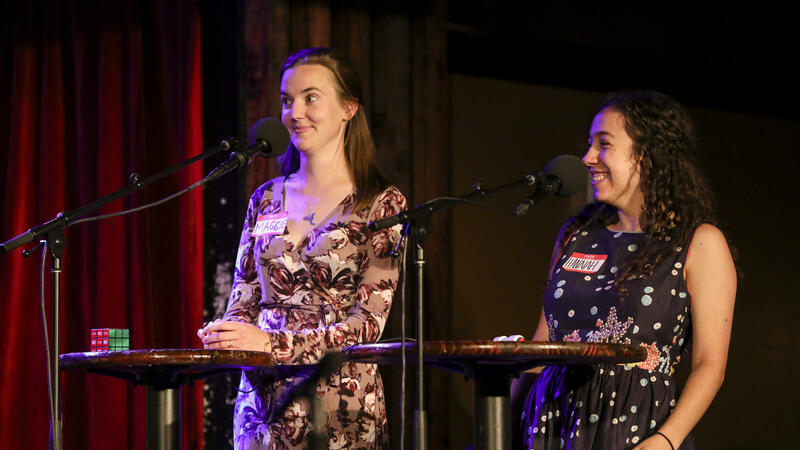 Let's bring back our finalists - Hannah Margolin, who was a 9-year-old ice cream thief, and Maggie Lloyd, who says a pen pal is like a diary that writes back. EISENBERG: Maggie and Hannah, your final round is called Emojis Louise. In this round, every answer is also an emoji according to the Unicode Consortium. Our big winner will receive an ASK ME ANOTHER Rubik's Cube signed by Awkwafina and Sasha Velour. We rolled a 20-sided die back stage, and Maggie is going first. Here we go. Maggie, this 1990 film starred Patrick Swayze, Demi Moore and a pottery wheel. EISENBERG: I'm sorry. That is incorrect. The answer was "Ghost." Hannah, Essie, Zoya, Deborah Lippmann and China Glaze all manufacture this colorful beauty product. EISENBERG: Maggie, two versions of this famous Edvard Munch piece were stolen from art museums but later recovered. EISENBERG: Hannah, red admiral, zebra swallowtail and blue morpho are all types of this creature. EISENBERG: Maggie, all-rounder, bowler, wicket and nightwatchman are terms associated with this sport. EISENBERG: Good guess. I'm sorry. That is incorrect. The answer was cricket. Hannah, at the 2016 Summer Olympics, the United States beat Italy in the women's final of this aquatic sport. EISENBERG: Maggie, the title of a best-selling children's book by Taro Gomi declares that everyone that does this. EISENBERG: Hannah, this is the official state fruit of Georgia - no buts about it. EISENBERG: Maggie, if you get this question wrong, Hannah wins. Maggie, this U.S. military medal honors personnel wounded or killed in combat. EISENBERG: Hannah, if you get this right, you win. Karen Carpenter and Meg White both famously played this instrument. Three seconds. EISENBERG: Sorry, that is incorrect. EISENBERG: The answer is drums. We're on the last question for each of you. All right. Maggie, you need to get this one right to stay in the game. Lady Justice is often depicted holding a sword in one hand and this device in the other. LLOYD: Scales - balance scales. EISENBERG: Hannah, if you get this right, you win. The original version of "Clue" contained six weapons - the lead pipe, candlestick, rope, knife, revolver and this. MARGOLIN: Is there a hatchet? EISENBERG: I love that game of "Clue." But I'm sorry, that is incorrect. We were looking for wrench. So we're going to a tie breaker. Here we go. Here's your tiebreaker. Leonard Nimoy says he based this hand gesture off of a blessing performed at an Orthodox synagogue. EISENBERG: That is incorrect. Hannah, can you steal? MARGOLIN: It's the live-long-and-prosper thing. EISENBERG: Yes, that is correct. The Vulcan salute. EISENBERG: You guys know how to create tension. Well done. Thank you so much, Maggie. And congratulations, Hannah. EISENBERG: That's our show. ASK ME ANOTHER's house musician is Jonathan Coulton. JONATHAN COULTON: Hey, my name anagrams to thou jolt a cannon. EISENBERG: ...And our live event sponsor, CuriosityStream, and our production partner WNYC. I'm her ripe begonias. EISENBERG: And this was ASK ME ANOTHER from NPR.